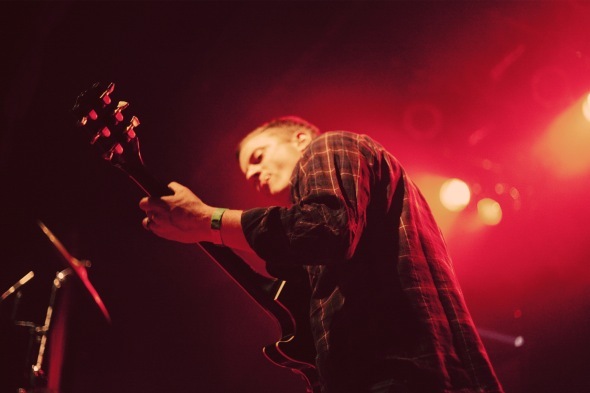 As Battles took to the Mod Club stage, I wondered what surprises this famously unpredictable band had in store for the evening. It took a while for the band's trademark hyper-kinetic riffs to kick in after a suspenseful, droning intro, but once they did it became clear that the band who made math-rock fun are back to defy a whole new set of genres. The New York three-piece returned to Toronto in anticipation of their forthcoming "Gloss Drop" album, their first release since the departure of founding member Tyondai Braxton. The show felt like an experimental trial run for the new material and past anthems "Atlas" and "Ddiamondd", featuring Braxton's inimitable contributions, were understandably absent. In Braxton's stead were recorded samples of several guest vocalists, who were also projected on big screens behind the core trio of Ian Williams, Dave Konopka and John Stanier. Matias Aguayo was up first on "Ice Cream", a gleeful tropical shuffle that appeared to remix itself over the course of its extended outro. Later, Gary Numan's contribution on "My Machines" was another revelation, with the band approximating an industrial-techno groove to match his new wave vocals perfectly. Dense instrumental jams that sounded like warring cassette tapes still dominated, as the band segued between songs and styles expertly for a near-continuous hour, stopping only to thank their Toronto-born sound man halfway through. 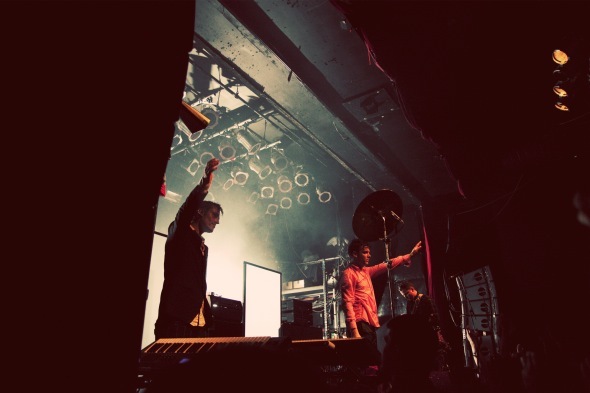 The crowd seemed most engaged during Battles' catchier moments however, suggesting that the band is truly in its element making alternative-dimension pop hits. 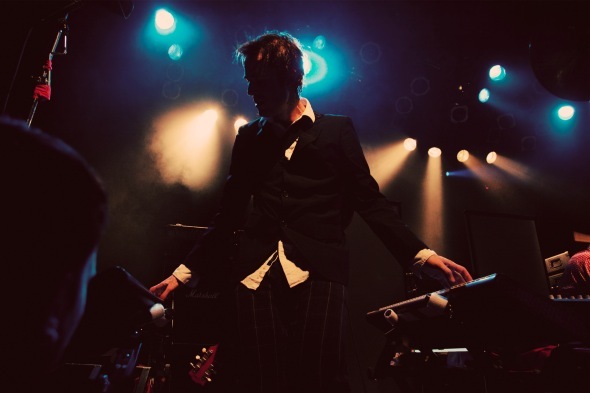 Battles are fun to watch too- Williams plays the quirky conductor in a dinner jacket, often prodding at several instruments at once. Konopka is his straight man counterpart, impressing with his guitar technicality while shooting down the audience with a fixed stare. In the centre drummer John Stanier's powerful presence stops the whole thing from collapsing in on itself. Like Stanier's unreasonably high crash cymbal, Battles sometimes reach further than is necessary. This can be a weakness, but its also their greatest strength- when things click the results are spectacular. Be grateful these guys are out there on the front line making messes and masterpieces for the benefit of everyone else.